In the animal kingdom, abalone belong to the phylum Mollusca, a group which includes clams, scallops, sea slugs, octopuses and squid. Mollusks are world wide and predominantly marine. They have a soft body surrounded by a mantle, an anterior head and a large muscular foot. Mollusks are best known for their beautifully formed and colored calcareous shell secreted by the mantle. The abalone join other snails, whelks and sea slugs in the class Gastropoda. Members of this class have one shell, as opposed to clams with two, (or the shell may be lacking altogether, as in the sea slugs). The spiral structure, so common in snail shells, is flattened in the abalone and may be obscured by fouling and shell boring organisms. Abalone are members of the family Haliotidae and the genus haliotis, which means sea ear, referring to the flattened shape of the shell. The name abalone is probably derived from the Spanish-American word aulon or aulone. The most conspicuous part of any abalone is the shell, with its row of respiratory pores. Shells are prized because of their inner, iridescent layer. The muscular foot has a strong suction power permitting the abalone to clamp tightly to rocky surfaces. A column of shell muscle attaches the body to its shell. The mantle circles the foot as does the epipodium, a sensory structure and extension of the foot which bears tentacles. The epipodium projects beyond the shell edge in the living animal. The epipodium surface may be smooth or pebbly in appearance and its edge may be frilly or scalloped. It is the most reliable structure for identifying abalone species. The internal organs are arranged around the foot and under the shell. The most conspicuous organ, the crescent-shaped gonad, is gray or green in females and cream colored in males. It extends around the side opposite the pores and to the rear of the abalone. The abalone has a pair of eyes, a mouth and an enlarged pair of tentacles. Inside the mouth is a long, file-like tongue called the radula, which scrapes algal matter to a size that can be ingested. The gill chamber is next to the mouth and under the respiratory pores. Water is drawn in under the edge of the shell, and then flows over the gills and out the pores. Waste and reproductive products are carried out in the flow of water. Since it has no obvious brain structure, the abalone is considered to be a primitive animal. However, it does have a heart on its left side and blood flows through the arteries, sinuses and veins, assisted by the surrounding tissues and muscles. FISHTECH INC. works with 14 different species of abalone worldwide. Click on the link to read some information about Red Abalone. The sexes are separate and can be distinguished in individuals as small as one inch when the gonads begin to develop. The eggs or sperm are released through the pores with the respiratory current. This is known as broadcast spawning. A 1.5 inch abalone may spawn 10,000 eggs or more at a time, while an 8 inch abalone may spawn 11 million or more. Spawning may be controlled by the water temperature or length of the day. The presence of eggs and sperm in the water may stimulate other abalone to spawn, thus increasing the chances of fertilization. The egg hatches as a microscopic, free living larvae. It drifts with the currents for about a week, then the abalone larvae settles to the bottom, sheds its swimming hairs (cilia) and begins to develop the adult shell form. If suitable habitat is located it may grow to adulthood. the chance that an individual larva will survive to adulthood is very low. Fortunately abalone and most mollusks are prolific spawners but the mortality still probably exceeds 99%. Hybrid abalone are not uncommon in areas where several species occur together. All species can hybridize, but the most common hybrids are red and white with pink. Abalone eat marine algae in the wild and on some farms. The adults feed on loose pieces drifting with the surge or current. Large brown algae such as giant kelp, bull kelp, feather boa kelp and elk kelp are preferred, although most others may be eaten at various times. For cultured abalone, many farms now use high quality manufactured food, which is healthy, efficient and produces very high quality meat. Wild abalone tend to stay in one location waiting for food to drift by. However, they will move daily, seasonally or when food becomes scarce for a long period. The color banding on many abalone shells is due to changes in the types of algae eaten. Juvenile abalone graze on rock encrusting coralline algae and on diatoms and bacterial films. As they grow they increasingly rely on drift algae. 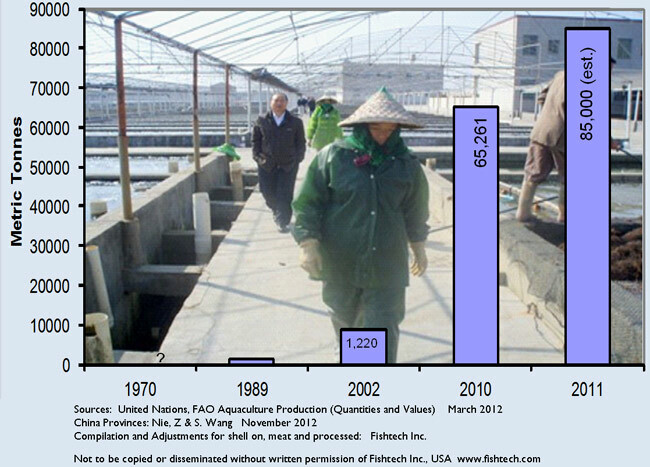 Abalone farming, to date, has been limited and hampered by the quality and quantity of the macroalgae sources worldwide. Although some abalone farms have successfully fed manufactured food for nearly 25 years, a high quality low cost manufactured food has been a recent development. Many new farms (and some older farms) are now asking Fishtech to design or redesign their equipment and procedures to allow their crop to be grown on 100% manufactured food. The improvement in growth rate and health of the animals and ease of production are truly astounding. Throughout its life, an abalone contends with a variety of predators. The eggs and larvae are eaten by filter-feeding animals. Though juvenile abalone hide, they are active at night (nocturnal) and crabs, lobsters, octopuses, starfish, fish and predatory snails prey on them. Abalone in shallow water may be crushed by storm tossed rocks. Large abalone are not threatened by the predators of their earlier life, but larger, and often more efficient predators now become important. Fishes, such as the cabezon, can dislodge some abalone and swallow them whole. Even very large abalone are no match for the crushing jaws of a bat ray. The sea otter is the most effective predator, capable of removing all exposed abalone within reach. Only those in deep crevices or under large rocks will survive. Abalone are one of the first food items taken by otters as they move into new habitat. In the last 20+ years, the commercial catch of abalone worldwide has declined from 18,000mt to a little over 10,000mt. Below are listed 6 major reasons for the decline. Number 5 (Illegal harvesting) is by far the largest and most important reason for the decline. Predation. Sea otters (major abalone predators) expanded their range in central California virtually eliminating recreational and commercial fisheries for abalone and other invertebrates. Commercial abalone harvesting is now primarily concentrated in southern California. Mortality of small abalone for many reasons. Over harvesting. Abalone are easily over harvested because of slow growth and variable reproductive success. Initial high harvests cannot be sustained. Competition. Sea urchins and other species, utilizing abalone food and living space. Illegal harvesting. Some people ignore the regulations enacted to protect abalone because abalone bring high prices. Loss of habitat. Coastal "development" and pollution have ruined large areas of abalone habitat.